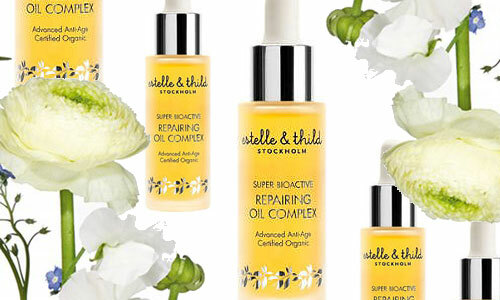 Furthering our facial oil obsession.. estelle & thild is a cult brand in Northern Europe (ie. land of the tall/blond/beautiful). They recently just sailed over to the US of A via Net-A-Porter Beauty. One of my favorite URLs on the www. estelle & thild has a variety of skin care products from lip glosses, to toners and cleansers, hand lotions, facial creams etc etc. But their most coveted items are their face serums and oils. The Age Control Serum + Repairing Oil Complex (above) is the recipe for extremely happy, protected skin that carries a youthful glow at any age. A mixture of antioxidants and marine micro-algae make it possible. My skin is currently eating it up. This formula is light and soft with just the teeniest bit of an airy floral aroma. Oh, and did I mention that all of estelle & thild’s products are 100% certified organic? We love this line.